Capt. Brett Wilson above with a 1200 lb giant bluefin tuna. With over 200 giant bluefin tuna caught since 2015, Capt. Brett Wilson and the crew of the Hindsight are truly among the "high liners" of the commercial bluefin tuna fleet. Hindsight Sportfishing is proudly sponsored by Pure Fishing, Penn, Costa, Raymarine, and Fishworks. First mate aboard the Hindsight is Captain Chris Nashville, shown above with a beautiful giant bluefin tuna caught. Below you will find a collection of some of the best giant bluefin tuna fishing videos available anywhere. All videos were shot aboard the Hindsight with Captain Brett Wilson and the crew of Hindsight Sportfishing. Check back often, as we will be adding new videos as the season progresses. Thanks! 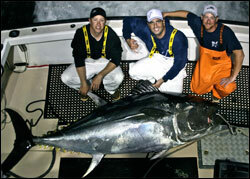 Fishing giant bluefin tuna with Hindsight Sportfishing and Capt. Brett Wilson. Congratulations on the double header, Captain and crew! End Game with Hindsight Sportfishing! Three Giant Bluefin Tuna with Hindsight Sportfishing! Three giant bluefin tuna tail wrapped on the Hindsight! Capt. Brett Wilson and Hindsight Sportfishing does it again! Two giant bluefin tuna hooked up at the same time, east of Chatham, MA, with Capt. Brett Wilson and the crew of the Hindsight. Two tail wrapped giant bluefin tuna behind the Hindsight. Hindsight Sportfishing with Capt. Brett Wilson and crew. Another successful end to a great bluefin tuna season with the crew of the Hindsight! Great giant bluefin tuna action! The Best Giant Bluefin Bite on Video! Great giant bluefin tuna bite on George's Bank with the Hindsight! A very productive trip to George's Bank aboard the Hindsight. Great giant bluefin tuna action! Spoon Fed Giant Bluefin Tuna! Captain Brett Wilson has a giant bluefin tuna take the bait out of his hand aboard the Hindsight. A charter battling a giant bluefin tuna aboard the Hindsight. Fish hard...fish with the best! Copyright © 2019 Hindsight Sportfishing LLC. All Rights Reserved.